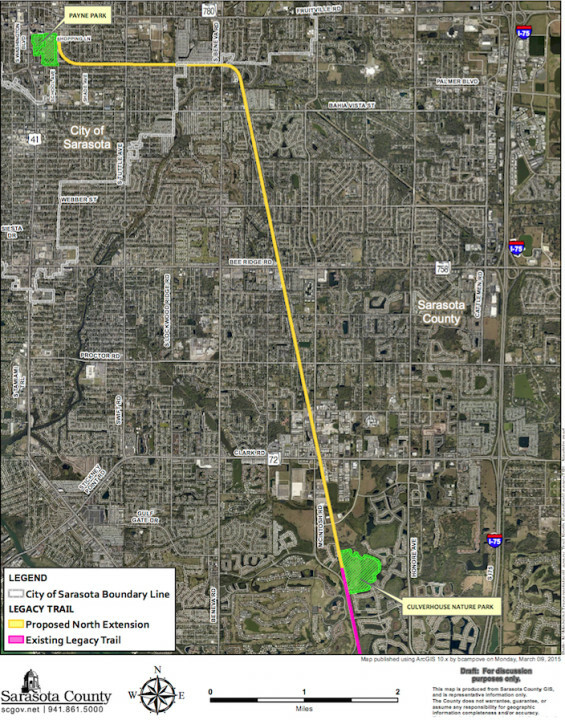 It took only about 10 minutes on Feb. 7 for the Sarasota County Commission to move another step in its effort to acquire the property for the North Extension of The Legacy Trail. On a unanimous vote, the board members approved a formal work plan for county Parks, Recreation and Natural Resources staff to pursue as a pre-acquisition step. 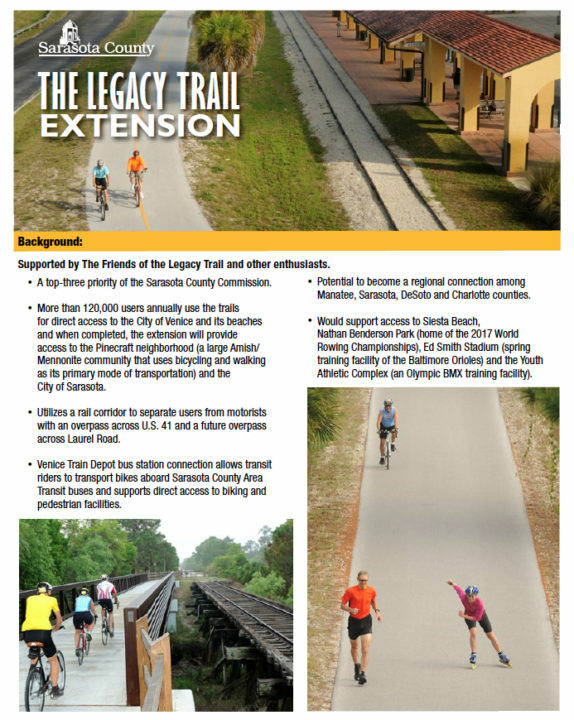 The secretary of the Friends of The Legacy Trail already had pleaded with the board members to do all in their power to make the North Extension a reality. Andrea Seager — who also serves as co-chair of the Friends’ Extension Committee — voiced her appreciation to state Rep. Joe Gruters of Sarasota for introducing a bill seeking $15 million from the state to help pay for the property. The Gulf Coast Community Foundation had provided $50,000 to the Trust for Public Land to assist with the endeavor, she added, and members of the public raised $89,824 to pay for a feasibility study for the North Extension. Completed in 2015, that document outlined various technical recommendations, such as a preferred trail alignment, necessary infrastructure improvements and pavement widths. The commissioners voted unanimously on April 1, 2015 to adopt the study. At that time, the estimated cost of construction of the improvements was $20.3 million. “The Legacy Trail was used over 175,000 times last year,” Seager pointed out. Along with the support of the Friends organization’s 1,000 paid members, she said, more than 8,700 people have signed a petition in support of the North Extension. “We urge you … to please find a way to use local funds … to leverage other funding opportunities,” she added. 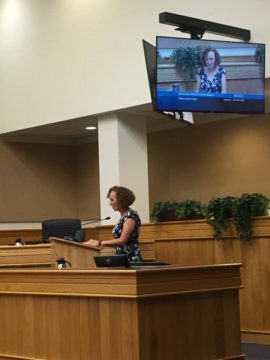 During her presentation about the work plan, Carolyn Brown, director of the county’s Parks, Recreation and Natural Resources Department, explained to the board that the county’s Parks Advisory and Recreation Council (PARC) reviews and approves such plans for lands that its members believe the county should consider buying. Each plan entails a thorough review, including consideration of the importance of the property to the county, potential uses, challenges and goals for management of the land, a strategy for its acquisition and the identification of possible partners and funding sources. If a work plan is approved, she continued, staff can undertake due diligence in regard to the site, including the pursuit of appraisals. However, Brown stressed, board approval of a work plan “does not commit funding toward the acquisition” or mean the county will follow through with the purchase. In deciding whether to recommend property for a work plan, she noted, the PARC members consider factors such as community access, connectivity to other property, the natural and cultural features of the land and its compatibility with community needs. The North Extension of The Legacy Trail would add a route 7.5 miles and 100 feet wide to the existing 10.6-mile corridor. The extension would run from the current terminus at Sawyer Loop Road in Palmer Ranch to Payne Park in downtown Sarasota, Brown said. It would provide a regional link from the city of Venice to the city of Sarasota, she added. Not only would it expand opportunities for bicycling, inline skating, walking and running, but it also would increase commuter options for downtown Sarasota workers and “provide greater access to safe routes to schools and residential communities. If the board approved the work plan, Brown continued, she and her staff would collaborate with the county’s Public Works Department employees on sources of funding for acquisition of the property from CSX and the Seminole Gulf Railway. A staff document provided to the board in advance of the meeting explains that Seminole Gulf leases the property from CSX. In response to a question from Commissioner Nancy Detert, Brown explained that she would come back to the board if staff were able to come to terms for purchasing the property. “Super exciting stuff,” Commissioner Mike Moran told Brown after she completed her presentation. Referring to Seager’s remark about the naming rights campaign, Moran then asked whether that should be part of the work plan. Brown replied that she felt she and her staff should vet that first, to get a better understanding of how it would work. Then, if staff were comfortable with its findings, she said, she could come back to the commission to ask it to amend the work plan. Commissioner Alan Maio told Brown he believes Seager was talking about naming rights in the context of raising funds to help with the purchase of the North Extension. Maio made the motion to approve the work plan, as well as the same type of initiative for a 2.79-acre parcel — including 440 linear feet of waterfront property — located at 1700 and 1710 Vamo Drive. That site would provide county residents expanded water access and recreational opportunities in conjunction with the adjacent Vamo Drive Park, Brown had explained. Surrounding residents, she noted, had voiced strong support for the county’s purchase of the property. Commissioner Charles Hines seconded Maio’s motion. “Keep chugging along,” he told Brown, before the board voted. The staff document provided to the commissioners prior to the meeting this week says county staff and the Trust for Public Land are “researching possible funding sources for acquisition, design/engineering and permitting” for the North Extension. 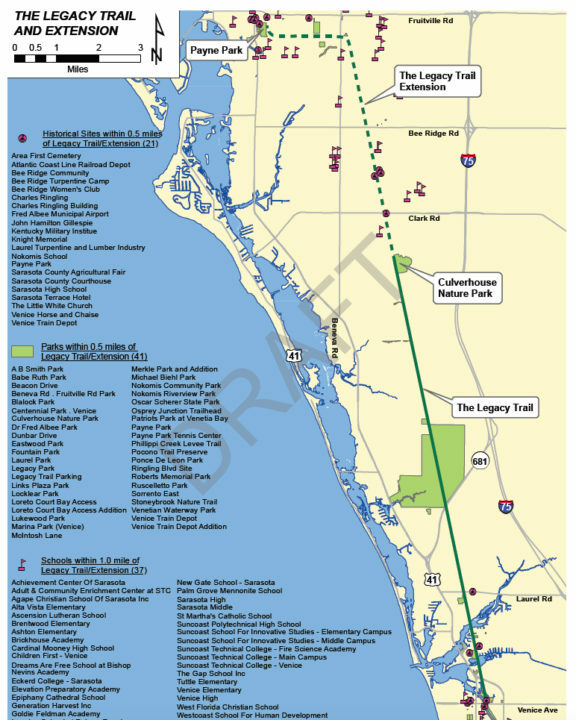 County staff has identified the Florida Department of Transportation’s Shared Use Non-motorized Trail Program (FDOT SUN Trail) as one potential source, the memo notes. Last fall, the project failed to win a SUN Trail grant, but Assistant County Administrator Mark Cunningham pointed out at the time that the county would apply again during the next grant cycle. Among other possibilities are the county’s Neighborhood Parkland Acquisition Program, state grants, future county mobility fee collections and the county’s Surtax III Program, which uses revenue from a voter-approved tax to pay for capital improvements on a priority list the board approves each year as part of its budget process. 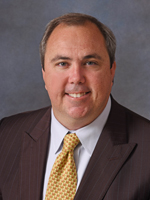 Gruters’ Florida House bill seeks a one-time $15-million allocation, with the money funneled through FDOT. The funding would be available on July 1, if the bill wins legislative approval and Gov. Rick Scott does not veto the appropriation. During a Jan 24 update to the board on its 15 priorities for 2017, Cunningham noted that staff negotiations were continuing with CSX and Seminole Gulf Railway. At the same time, he said, the Trust for Public Land was getting appraisals for the North Extension property.